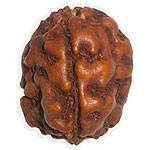 Three mukhi rudraksha is ascribed Tri-agni and its use keep one free from all type of bad luck arising there from. It bestows intelligence, education and wealth and dispels all dangers from fire fevers and cleans the sins. It gives confidence and alleviates depression, is useful during pregnancy also. It is ruled by Mars and pacifies evils of Mars viz. Land, litigation, widowhood, blood poisoning and accidents. It is especially beneficial to natives born in Aries, Leo or Sagittarius Lagna. It is worn to boost the self-confidence and to counter depressions. It also provides physical strengths and helps in cure of several diseases. It also wards off ill-luck and tensions and can help purify sins. 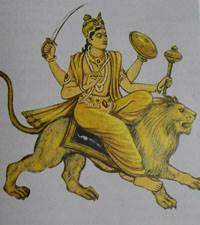 It symbolises lord Agni - the fire god, a son of Dyaus and Prithivi; he is called the son of Brahma, and is then named Abhimani; and he is reckoned amongst the children of Kasyapa and Aditi, and hence one of the Adityas. This bead destroys ill luck, if worn regularly. It bestows health, wealth and knowledge too. If a rosary made of 108 beads of indonesian 3 mukhi beads and is worn, sins of even earlier births are destroyed. One obtains health and one becomes free from diseases, killing of Brahman, woman and other grace sins are also destroyed . 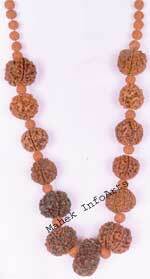 All the merits obtained from the worship of fire god, are attained by wearing its rosary. The wearer enemies are vanquished. He does not suffer any loss from fire. He is also protected from arms and weapons. 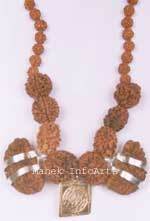 It signifying Mangal or planet Mars and used to appease Mangal Dosha in the horoscope. Malefic mars effects are, disease of blood, blood pressure, weakness, disturbed menstrual cycle, kidney etc. 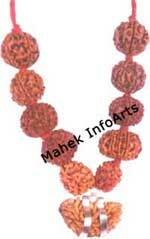 Depression, negative and guilty feelings, inferiority complexes can be lessened by wearing this mukhi. It is one of the best remedy for Mars. 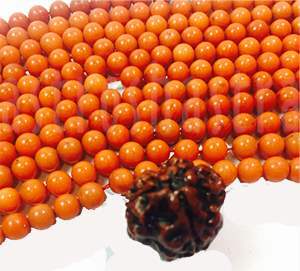 If Mars is deblitated in the horoscope, wearing 3 mukhi is more beneficial than wearing Red coral. Mars develops courage and initiative without selfish purpose, learn to relax, calmdown and practice non violence, control anger and use of energy, physical and mental strength for defence of dharmic principles . Malefic planet mars in chart of woman is one of the main reason, who face mis-carriage or abortion. Pregnant women shall wear it around their neck or tie it on their left hand/arm. It is very effective in treatment of jaundice. Its wearer always remain healthy and active. Those having mangalik dosha/kuja dosha in there charts shall also wear it to negate the malefic effect of mangal dosha and improve their marital life. 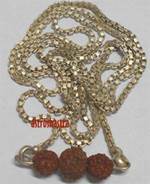 Mangal dosha is very important in judging happiness in marriage, therefore people with Mars in there kendra shall definately wear pendant with 3 mukhi bead. 2. Removes the Malefic effects of planet Mars like anger, depression or Suicidal Tendencies. 4. Cures diseases of Blood. 5. Helps in disturbed Mensural cycles. 6. It helps in keeping you energetic. 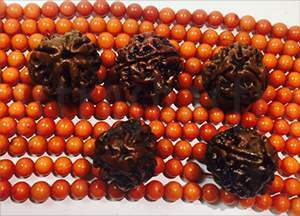 How to wear three mukhi rudraksha ? 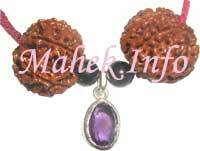 Tri mukhi rudraksh can be worn in Gold , Silver or Copper Pendants. It can be worn with any other bead. It is very effective if worn with Red Coral, Mangal Yantra, Bajrang Yantra, Mahamritumjay Yantra silver pendant. It should be worn only after being energized by its mantras. Panchakshari Mantra for wearing is:- "Om Rem Hum Hrim Hum".